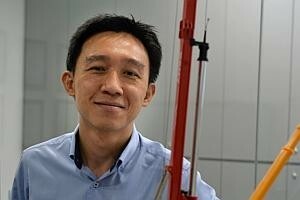 DESPITE his company having been in the market for only four years, Toh Chin Wei has become a familiar face in the construction industry. As founder and managing director of P-One (S) Pte Ltd, the entrepreneur led his company (which specialises in piling works) to break even in its first year of operations. The following year, P-One's net profit rose a whopping 500 times, on a five-fold increase in revenue. These achievements, along with others in innovation, garnered P-One its first Enterprise 50 Award (2013). Originally incorporated as a machinery-leasing company, P-One made a strategic shift in 2010 to capitalise on the S$35.5 billion Singapore construction industry. Under Mr Toh's stewardship, the company has thrived in the capital-intensive construction industry. He attributes the company's success to its focus on developing a productive workforce, strengthening its operations, and relentlessly driving innovation. The most sophisticated machines are only as good as the operators who work them. With each pile costing thousands of dollars - and each piling rig going into the hundreds of thousands - piling operators bear a heavy responsibility. Their skills and experience are integral to the firm's ability to meet tight deadlines, without compromising on safety and cost. The continuous upgrading of skills is thus emphasised at P-One - a certified Continuing Education and Training (CET) Centre of the Building and Construction Authority (BCA) - and outstanding workers are recognised with the Star Worker Award that comes with monetary rewards and customised T-shirts. With locals unwilling to work in such a physically demanding environment, it becomes increasingly important for P-One to keep the morale of its on-site foreign workers high. Beyond taking care of their lodging, food and transportation, P-One celebrates workers' cultural festivities and organises annual dinners to keep everyone updated on the company's latest plans and achievements. "It's important to inculcate a strong familial culture within the company," said Mr Toh. The camaraderie reduces employee turnover, while improving morale and teamwork. This culture of high sociability and solidarity is what sets P-One apart from its competitors, endowing it with a committed and motivated workforce. P-One is more than just a piling company. In line with the government's push for higher workforce productivity, it seized the opportunity and became one of the first Approved Training and Testing Centres (ATTC) in 2011 - a government initiative aimed at conducting formal training for workers in the construction industry. Despite its short history, P-One has already worked with several statutory boards and public agencies, such as JTC Corporation and the Housing & Development Board (HDB). Its interests in the private sector span a wide range of projects including condominiums, desalination plants, warehouses and factories. P-One's phenomenal profit growth can also be attributed to the management's ability to control operational and developmental costs. For instance, instead of purchasing an entire range of equipment, P-One has found a good mix of buying and leasing equipment, mitigating the risks associated with a huge initial capital outlay. Another cost challenge P-One has tackled successfully is the fluctuating foreign worker levy imposed by the government - which can cost up to a hefty S$950 per foreign worker per month, depending on the worker's proficiency level. It is here that Mr Toh's focus on training his workers has paid off handsomely, enabling the company to keep its levy rate at the minimum S$300. P-One's quest to control costs has not compromised work quality. The company's relationship with suppliers is built on mutual adherence to stringent quality standards, and tempered by its strong collaborative philosophy. It believes communication and feedback with suppliers is necessary for all parties to benefit. In the face of stiff competition in the construction industry, having a good reputation and public image is imperative. P-One is committed to minimising the noise and inconvenience generated from construction works, tapping the National Environment Agency's (NEA) Quieter Construction Fund (QCF) to acquire quieter equipment and addressing complaints earnestly. Through these, P-One has established itself as the go-to partner for notable developers with high public visibility. The construction of the two integrated resorts in Singapore catalysed the nascent property boom, and the construction industry rode the apex of this wave. But peering through the widespread optimism, Mr Toh foresaw a problem on the horizon: a scarcity of skilled labour able to conduct piling operations would soon become an issue. Indeed, for a time, there was such a dearth of skilled piling operators that a single operator commanded a salary in excess of S$10,000 per month. When BCA sought to tackle this issue by setting up ATTCs, P-One immediately became the prime choice, as Mr Toh had already begun looking at ways for his company to secure the necessary infrastructure and resources to equip its workers with the proper skills and accreditation. As a result, P-One was awarded the exclusive right to function as the sole ATTC in Singapore in 2011 for a year, tasked with training and testing workers for bored piling operations. That year, P-One trained over 500 operators, alleviating the severe labour crunch in bored piling operators. The management's foresight has been critical in steering the company on its path to success. When it comes to day-to-day operations, Mr Toh and his team often seek new ways to improve and innovate. It was this persistence that led them to the development of new technologies that have since been patented and implemented by the company. Despite being a relatively small and young company, P-One's creative differentiation strategies have sharpened its edge over its many competitors. Inspired by his father, Mr Toh does not want P-One to become just another faceless piling company, competing on price by depressing margins and worker wages. Instead, he wants it to be a piling company standing at the forefront of the industry, known for efficient workmanship delivered to the highest standards of quality and safety. He maintains a positive outlook for piling companies, saying: "Piling is at the core of the construction industry - an indispensable upstream process that paves the way for subsequent construction and development."